We can’t predict who will win election in 2014 but overall BJP appears to be hot favorite. Modi wave is all over India. Poll survey speaks that BJP will get 230+ seats. If we believe on this poll survey and assume that BJP will win election and Narendra Modi will be next PM. Sensex will defiantly surge by 2500 points. Earlier also on election result when UPA got majority in 2009 Sensex surged to 2110 points. In all good faith if Sensex surge on election result which stocks can give you good returns or which stock you should buy before election result. I am here with answer! Larsen & Toubro is our first pick. L&T is well diversified company with presence in infrastructure, power, heavy engineering & lot of other sector. With formation of new stable government it is expected that strong development agenda will bode well with L&T. It is observed that L&T is most consistent stock performer in election period. 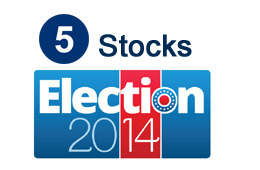 This stock yielded positive return 3 months prior to each of the last 5 general election. Average return 23%. Mahindra & Mahindra is stock from auto sector which will likely to get benefit from election. M&M operate in SUV and tractor segment of auto industry. It is expected that auto sector will grow by 7-8% in FY15. M&M stock has given very good performance in last 5 general election. Stock gained 19% in election times. Maruti is another stock pick from auto sector. Maruti is leader in passenger car segment in India. Maruti holding majority of Indian market share in passenger car segment almost 50%. Maruti yielded average absolute returns of nearly 21% in the 3 months prior to the last two elections. We expect same performance from this stock this year. From media sector we think Zee Entertainment will come out as winner. Every election media and TV broadcasting company is getting more income from advertisements. In FY15 overall ad spend is likely to grow by 10-12%. Zee entertainment yielded average 21% return in 3 months during last 5 elections. Leading private sector bank ICICI is our second pick. With boost in Infrastructure and economy demand of loan is likely to grow & will provide benefit to bank like ICICI. In auto sector Tata Motors. In cement sector Ambuja cement and from media sector HT Media, DB Corp are likely to perform better. Pure Modi stock and Gujarat Base stock on radar are Adani Ports, Adani Enterprises, Gujarat Pipavav, GSFC, GMDC, Sintex Industries, United Phosphorous, Atul and Arvind Limited.